We’ve I’ve been trying to eat out go through the drive-thru less. Yes, it is totally my problem. Nobody else in the House of Hills has the addiction to the drive-thru. I think it’s actually my addiction to the fountain diet coke. I LOVE fountain diet coke That’s an entirely different post. My biggest weakness is breakfast. It’s JUST SO EASY to grab a biscuit (and diet coke) on the way to work. Thankfully, I only go to the office three times a week. So that’s only three times that I’m out at breakfast. But still, that ADDS up – and fast! Two weeks ago, I made some Eggwiches (Thanks to onceamonthmom.com for the recipe link.) and froze them. They’re great to take to the office. I’m really enjoying them. But, I wanted something else to swap off with the Eggwiches so that I wasn’t eating the same thing every time I went to the office. I decided to make a BREAKFAST QUICHE jumping off a recipe from the cookbook Maggie got for Christmas last year, Paula Deen’s Kids Cookbook. Place meat in bottom of pie crust. Sprinkle cheese over top. Mix together the egg substitute and cream and pour mixture over cheese. 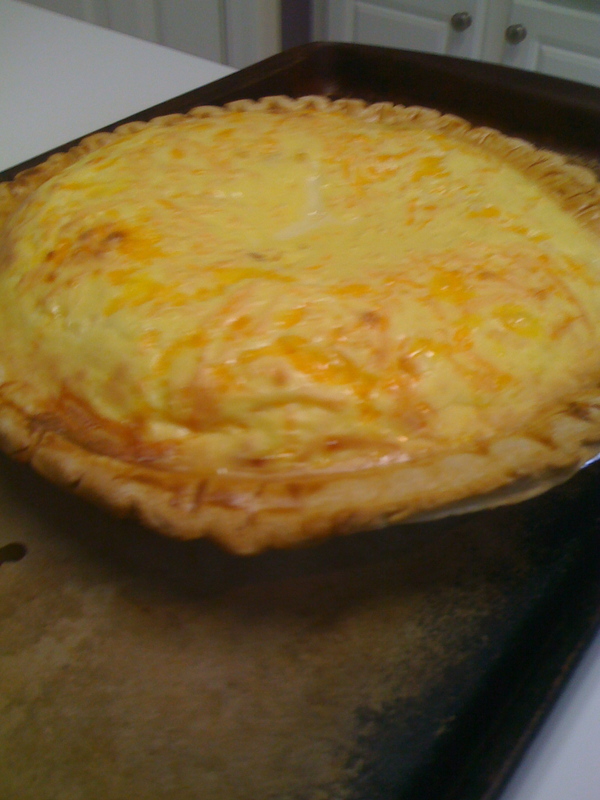 Place the quiche on a cookie sheet for overflow. Bake for 35-40 minutes/until center is not jiggly. To Freeze: Cool completely and then cut into serving sized slices. Wrap each slice in plastic wrap and then place all slices in freezer bag. Let thaw overnight and then heat to serve. Linked to Ultimate Recipe Swap:Eggs. This entry was posted in Recipe by Kathy. Bookmark the permalink.